For a general chemical resistance guide, click here. 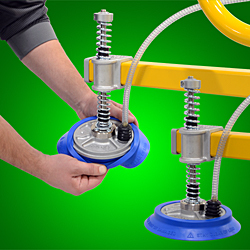 We often get asked what we recommend to clean our rubber suction cups and sealing rings. People realize that the proper maintenance and cleaning of vacuum cups and seals is critical in extending the life of the vacuum equipment and ensuring proper safety. Most mild household or auto rubber cleaners you have around will clean rubber. Just stay away from the greasy types of rubber protectants which could make the vacuum cups slippery. Most auto rubber cleaners on the market leave a greasy film which could allow the vacuum cup to slip or hydro-plane. Stay away from these. If you do use an auto rubber dressing get the mat non glossy finish type. Citrus based cleaners or Mineral Spirits work well and are commonly available. Both are inexpensive and can be found at any hardware store. Mineral Spirits used with a wash cloth type rag actually cleans well if used occasionally. Alcohol based products will dry out rubber if used frequently but they will remove greasy dirt on the rubber. Even hot dishwashing soap and water sometimes work well depending on the nature of the dirt on the rubber. Rubber needs protection against the two main environmental enemies of Rubber Elastomers which are UV Ultraviolet Light and Ozone. This is what ages, hardens and starts to make cracks in the rubber sometimes referred to as dry rot. From our testing we found that a good non greasy vacuum cup cleaner product to protect rubber from ultra violent light and ozone is 303 Aerospace Protectant used with a wash cloth type rag. Here is their website 303 Products www.303products.com We recommend this or similar equivalents for anywhere you have rubber which is exposed to sunlight and the ozone. 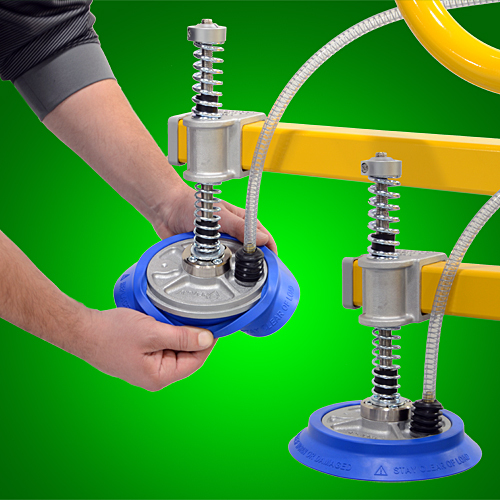 This is good for rubber cup lifters used outdoors. These type or class of protectants are big in the marine industry which is the toughest of environment rubber comes in contact with. Technical Glycerin has recently been marketed as a special cleaner for some reason. We have tested it and found it does not do anything more than other common rubber dressing. On the negative side it leaves a greasy soapy film that attracts dirt fast and makes the cups slippery. Because of the film it leaves it ranked as one of the worst rubber protectants and we would not recommend it. Keep in mind how rubber handles an environment and performs is usually stated on rubber “swell” percentage. This is the reaction of rubber to another chemical it is coming in contact with. The rubber will swell and get sticky and soft. The percentage of swell determines how badly the rubber is affected by the chemical. Click here for a chart listing chemicals and how they affect rubber.